The tricky thing about demographic change is that we only start to see the consequences of our actions when it is already far too late. On average, society is becoming ever older, and of course this applies to the working population too. PPE manufacturers must overcome this challenge as well, and above all, for new developments they must answer the question: does this PPE actively or passively contribute to preserving an employee’s capacity to work over the long term? What essential features must PPE provide? ⋅ Head protection: EN 397, among others, applies to safety helmets and describes protection against “falling objects and consequential brain injury and skull fracture”. EN 812 relates to bump caps and sets out how they must be designed to protect wearers from impact-related head injuries. There are also other standards for specific applications, such as forestry or electrical installations. ⋅ Eye protection: The most important eye protection standard, EN 166, defines requirements for safety eyewear regarding particles hitting the lens at high speed in addition to optical grade and filter properties. Additional sub-standards such as EN 170 and EN 172 regulate UV and solar protection respectively. Furthermore, EN 169 applies to safety spectacles designed for welding applications and the associated flying sparks and infrared radiation with this. ⋅ Hearing protection: EN 352, which is divided into several sections, enshrines the requirements for various types of hearing protection. This mainly related to noise pollution and disturbances, but speech and signal recognition can also be tested and certified in special tests. ⋅ Respiratory protection: EN 149 applies to filtering respiratory protection marks and describes the three safety classes – FFP1, FFP2 and FFP3 – that each protect the wearer from different types of particles. These standards are mainly intended to designate products that prevent the negative effects of immediate risks. This is an important cornerstone for preserving working capacity over the long term. However, severe injuries are not the only thing that can reduce work performance; non-ergonomic processes or equipment can also have noticeable medium-term and long-term consequences. 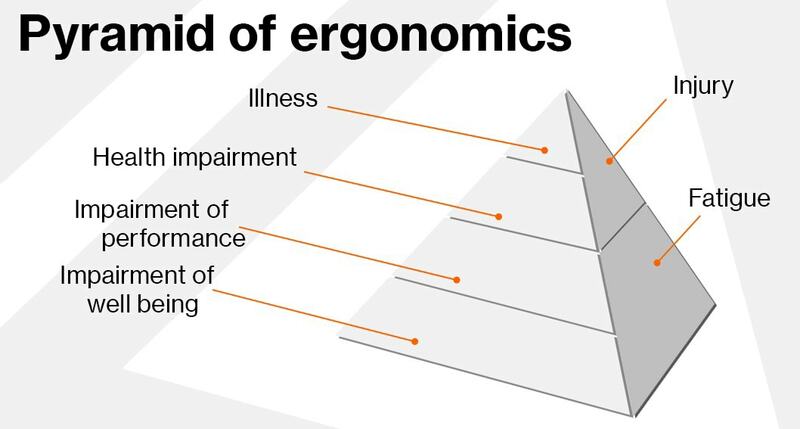 What exactly does “ergonomics” mean? Simply put, ergonomics is the science of optimal processes and products. It aims to always achieve an objective as directly as possible and without any form of interference. With ergonomics, there is also above all a focus on user friendliness of tools or machines, but it involves preventing discomfort and avoiding the onset of premature fatigue as well. Protection according to regulated standards maintains work performance in the short term, whereas ergonomics acts over the long term. But it is not always easy to combine the two optimally. 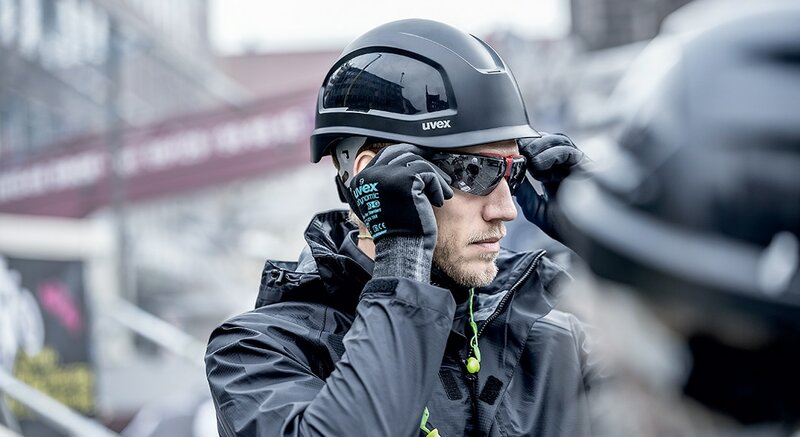 When it comes to protection in accordance with standards, there are only minor differences between PPE manufacturers – if safety eyewear or a helmet meets the requirements of a certain standard, the wearer is generally protected sufficiently against the dangers present in their respective applications. Ergonomics is completely different story: as yet there are no norms, no standards and no uniformity. What does ergonomics mean for the area of head and face protection? Even for applications not subject to any standards, uvex compares ergonomic factors such as pressing force in the test laboratory. The desired ergonomic qualities of a safety helmet are easy to determine: it must be as light as possible and the weight must be evenly distributed across the head in order to not burden the neck musculature and cervical spine unnecessarily. This extends to the visor too, which can cause enormous strain if positioned poorly. For respiratory protection masks, the greatest ergonomic potential lies in reducing inhaling and exhaling resistance by using particularly efficient materials and vents. As another example, ergonomics in terms of hearing protection is focused on reducing pressure as well as ensuring a pleasant wearer climate below a pair of close-fitting earmuffs. For safety eyewear, weight and weight distribution are a decisive factor, but above all avoiding sight impairments (e.g. quickly fogging up) is also important. Moreover, all types of PPE benefit from one particular positive side effect: the more ergonomic the product, the better the wearer acceptance in general. What are the solutions for this? One approach is to make use of PPE developed by a system manufacturer. PPE for the eyes, hearing, head and breathing that is manufactured from a single source generally tends to have all been developed in close cooperation. The effects of these individual components therefore often dovetail effectively. Poorly fitting combinations of respiratory masks with safety eyewear or hearing protection with safety helmets can especially result in reduced wearer comfort with long-term consequences. The major benefits afforded by PPE can only be leveraged when individual components are effectively adapted to each other. However, this does still not represent the pinnacle of ergonomics. And PPE manufacturers are well aware of this. 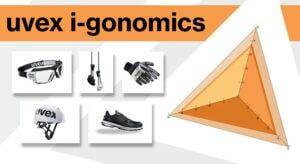 For this reason, there are a variety of approaches aimed at conveying and measuring ergonomic features: we, for example, are collaborating with various research institutes, applying scientific principles in order to get more out of the uvex i-gonomics product system. Advanced digitalisation is also presenting us with huge opportunities: an intelligent insole that recognises poor posture can offer wearers great ergonomic support. Moreover, gesture control, NFC chips in safety gloves, and integrated displays in safety eyewear lenses are heralding a new, much more ergonomic era in our world of work. There will certainly be lots more exciting ideas and concepts – and ultimately of course products – emerging in this area in the year to come. Exciting times are on the way! This article was written in cooperation with the Ergonomie-Markt magazine.